The point to understand is that the HIGH BLOOD SUGARS in Diabetics cause damage to the blood vessels. This damage to the blood vessels is what causes the various problems and complications associated with diabetes. Diabetes also causes the FIGHTING ABILITY(IMMUNITY) of the body to go down and thereby makes a diabetic more prone to infections. So how does the damage to blood vessels cause the problems associated with diabetes? 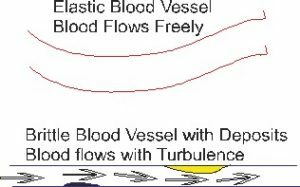 The damage to the blood vessels causes them to become BRITTLE which causes blocks in them and reduces the flow of blood through them. This stoppage of flow is what causes the various complications of diabetes like Heart attacks, Kidney failure, Brain strokes, gangrene etc. Why is it important to save the foot, even the smallest part!